Before I start this review, I'd like to thank GamersStuff for making this review possible. I encourage all of our viewers to check out their amazing line of performance and budget mousepads. Mouse pads have come a long way in the recent years. Just last year, I was happily using my three-year-old freebie cloth mouse pad for intense gaming, graphics work and leisure browsing. I never thought much of "performance" mouse-pads other than that they were a marketing gimmick. When I finally made the transition to a "performance" mouse-pad, I immediately noticed a difference. With the new mouse-pad's slick surface, my mouse was more responsive to sudden movements and could glide across the pad's surface with the slightest touch. However, after a month of pure bliss with the new pad, "worn areas" (areas where the pad isn't as slick as the rest of the pad due to usage) started to form, which really hindered the pad's performance. After some help at a public forum, I found a cure for these worn areas. Applying Pledge or Armor All to the pad would once again give the pad a temporary slickness. Unfortunately the worn areas appeared more often and more frequently than I preferred and applying Pledge every two weeks wasn't something I wanted to continually resort to. Today I review the GamersStuff (formerly EverGlide) fuZe performance mouse-pad. Will this pad continue beyond where the EverGlide Optical Giganta pads fell short? Or will it, like its predecessors, fall into the "Needs Improvement" pile? The fuZe mouse-pad arrived in a padded envelope with two sheets of paper. One of those sheets was an advertisement for a new GamersStuff mouse-pad, the EverGlide Ray. The other sheet was the fuZe's specification sheet along with some of the pads features that should sit the fuZe at the head of the pack. The first thing I noticed about the pad was its thickness, or lack there-of. The fuZe is about � the thickness of the EverGlide Giganta. The fuZe takes up exactly the same surface area as the EverGlide Giganta, which is nice because I won't have to make room on my desk for the pad. Height from Middle 8.5" 8.5"
Usable Height from Middle 7.75" 7.75"
Performance mouse-pads' secret to success is their surface. The surface of the fuZe pad is a grain texture, so there are gaps between these small bumps on the surface of the pad. 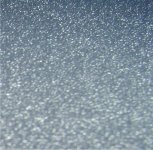 You would think that this kind of surface would rip your mouse feet to shreds, but what this kind of textured surface achieves is less contact between the mouse feet and the pad, minimizing any possible friction. 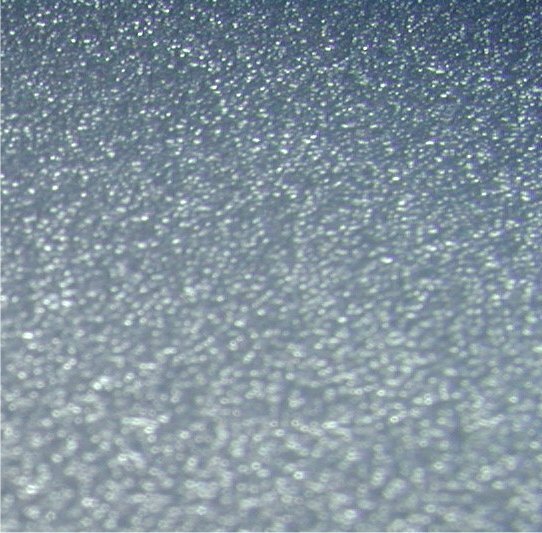 This kind of surface has been known to deteriorate mouse feet, but Teflon tape fixes that problem. As far as my personal experience goes, my Logitech Wireless Optical Mouseman's feet remain intact after almost a year of strictly using performance mouse-pads. Like all new mouse-pads, the fuZe's surface was extremely slick, but the real test would come after a few strenuous hours of use. Luckily, I received the fuZe the day of a LAN I was participating in; the perfect opportunity to really see what this pad had to offer. Through the long hours of the night, the fuZe performed flawlessly. I didn't notice any slowdown or rough/sticky areas. While I can't completely base my improved kill:death ratio on the fuZe's effectiveness, it helps. I was originally scared that I wouldn't be able to compare the fuZe to the EverGlide Opticals because the Opticals were designed specifically for Optical Mice, whereas the fuZe is "compatible with optical mice." I tested both a balled mouse and an optical mouse, I preferred the optical mouse, but noticed no difference between the two. After a month of regular usage (I received the pad early January), I noticed that a small worn area has developed in the middle of the pad. It is not really noticeable unless my mouse ventures outside of the worn area's boundaries and feels the slickness of the other parts of the pad. Even with the worn areas, the pad performs better than both my EverGlide Opticals and RatPadz GS. The one thing that disappoints me is how much the logo has faded. 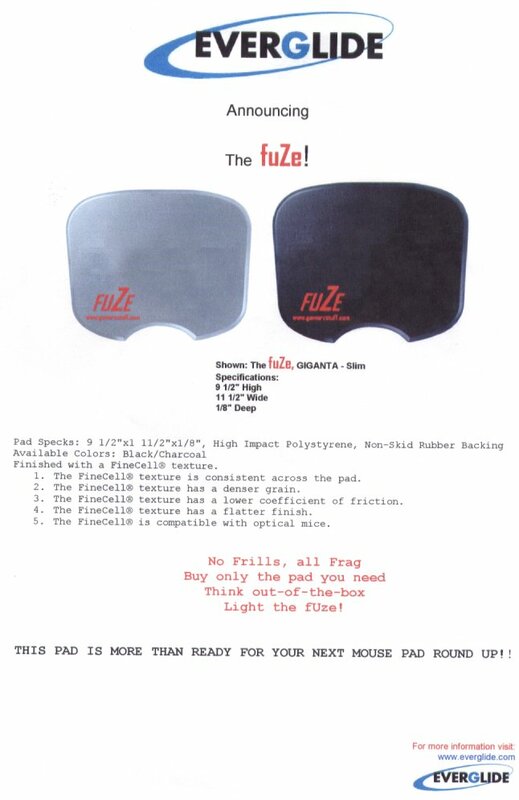 When I first received the pad, the fuZe logo was a bold red color. Now the red logo has worn off and has started to blend in with the rest of the pad. Considering how well the Optical's logo held up, I was disappointed with the logo disappearing. All logo complaints aside, if you have $15 and are still using a budget cloth pad, the fuZe is a good investment. If you are already using a performance pad such as a different EverGlide or fUNC pad, the performance difference is not great enough to warrant a change.